Witches’ Wheel is a flat ride manufactured by HUSS Park Attractions. The ride opened at Cedar Point in 1977. Witches’ Wheel is a spectacular European flat ride. The fact that it is considered a “flat ride” is a testament to the strange language of the amusement industry. It is designed to be transportable, although the Cedar Point ride is a decidedly permanent installation. Designed and built by Huss in Germany, this particular ride’s common name is Enterprise. 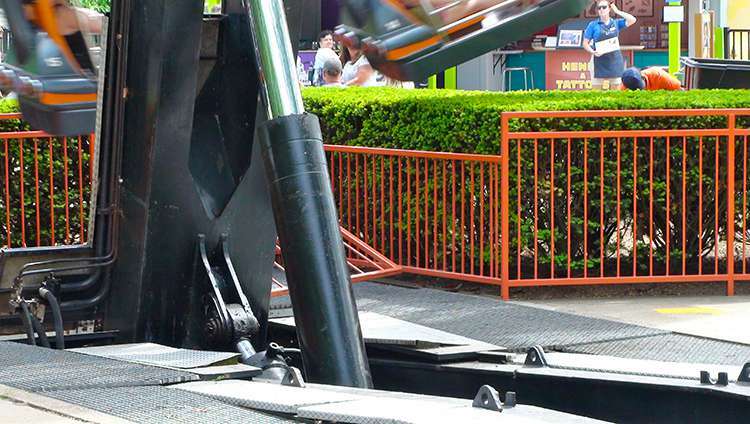 In addition to Enterprise, Huss built several rides on this same platform including a stand up version called a UFO and, most recently, a prone-rider version called a Fly Away. There is also a larger version called the Skylab which has double-size tubs that hold four people in two compartments. Huss introduced the Enterprise in about 1972, and built around 75 rides worldwide. According to Huss, most of the Enterprise rides built are still operating. Certainly we have all seen the reactions of new riders on the Witches’ Wheel who have seen the ride operate but haven’t ridden it before. They all do the same thing: they sit down, slide the gate closed, and start searching for a seat belt. Then the ride starts up and these riders discover that the Witches’ Wheel is one of the very few rides at Cedar Point which does not have a seat belt. Of the rides at Cedar Point without seat belts, it is the only one that turns riders upside-down. Riders are contained in the cage-like free-swinging gondola, but do not appear to be actively restrained in any way. To answer Jess’ question, let’s start with normal operation. Witches’ Wheel is approximately 70 feet in diameter. The documentation I have seen says the clearance envelope is 22 meters (72′ 2″). 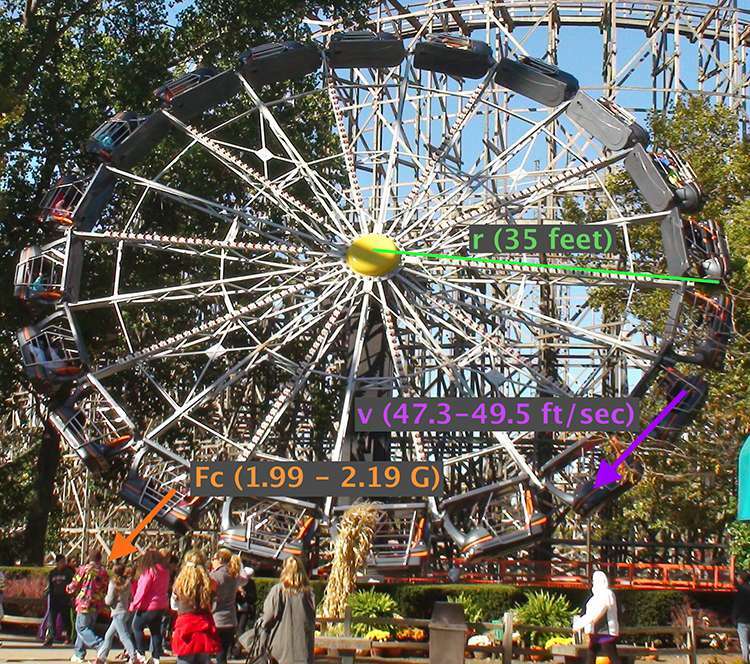 Huss requires clearance of 20 inches from the ride all the way around, which puts the actual wheel diameter at about 68 feet. For our purposes, 70 feet works fine. 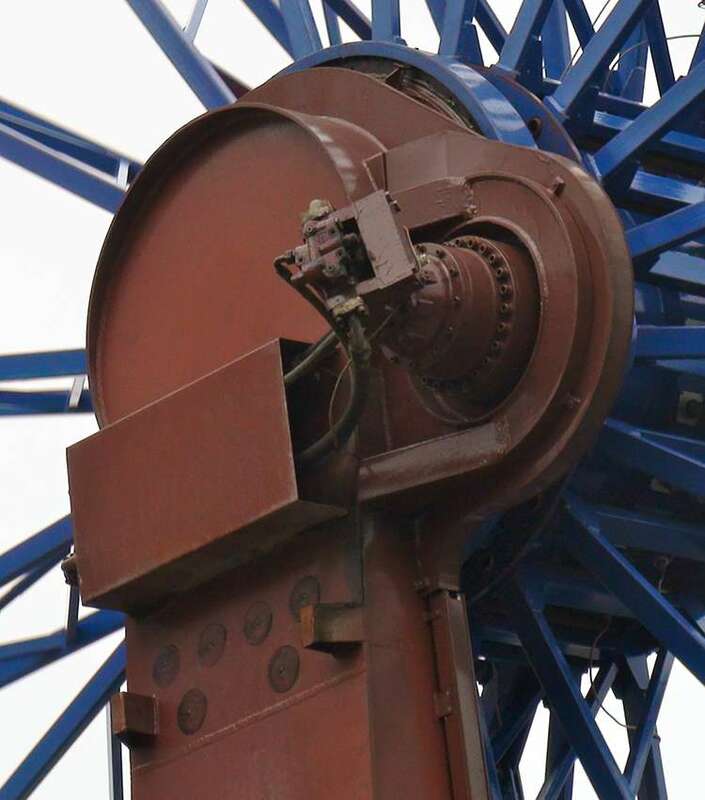 The ride controls are interlocked so that the boom arm will not lift until the wheel is rotating at a minimum speed of 12.9 RPM. I don’t have an official specification for the maximum speed of an Enterprise, but the similar UFO operates at a maximum speed of 13.5 RPM. The ride has two hydraulic systems operated by a single electric motor located near the midway end of the ride. One system drives the rotation motor, and the other operates the lifting cylinder. The hydraulic motor is started and brought up to speed, then fluid is pumped into the bottom of the 3-stage single-ended lifting cylinder. I'll get back to the significance of that in a moment. The lifting cylinder extends, raising the ride to its full height, up to an angle of about 87°, or very nearly vertical. The ride runs a bit at full height, is brought back down, and then brought to a full stop. Under normal circumstances, the rotational motor is not stopped and the brake is not engaged until the arm is fully lowered to its horizontal position. Standing on the ground, we see the seat pulling the rider inward towards the center of the wheel, exerting a centripetal force; sitting in the seat we feel pushed outward away from the wheel. On an amusement ride, we’re usually most interested in something called the Patron Coordinate System, which simply means that we are calculating and measuring ride forces as they are experienced by the rider. Since the rider is in an inertial frame of reference, for our purposes, centrifugal force is very real. Now let's do a little calculating. You may recall from previous discussions that for our purposes, because the mass of the system is kept constant, and because force is the product of mass and acceleration, when we talk about forces on an amusement ride most of the time we are really interested in acceleration, due to the linear relationship between acceleration and force. But if mass is constant, we can simply acknowledge its presence and study the acceleration, which we can then translate into g.
The linear velocity of the Witches’ Wheel can be derived from the size of the wheel and its rate of rotation. Since the wheel is 70 feet in diameter, that implies a 35-foot radius, and a circumference of 70π feet, or about 220 feet. Plugging that into our formula for centrifugal or centripetal acceleration. So the wheel rotates at a speed which generates an acceleration of almost exactly 2G. As the wheel accelerates, that means the gondola is subjected to an outward force of 2G and a downward force of 1G from gravity. That resolves to arctan(2/1) or about 63° at about 1²+2² = 5 or 2.24G. You can see this by the way the gondolas swing outward just before the ride begins to lift. Now, with the wheel rotating at full speed, the arm is lifted into the vertical position. The gondolas will swing a little as the effect of gravity is rotated around the gondola. As the wheel is lifted, the net force begins to change. Over the course of the next 22 seconds or so, the +2G outward force applied to the rider by the rotation of the wheel is brought into alignment with gravity, meaning that at the bottom of the wheel, the outward force of +2G combines with gravity to drag the rider into the seat with a net force of +3Gz. Meanwhile at the top of the wheel, gravity pulls the inverted rider “upward” toward the center of the wheel, effectively subtracting from the outward +2G force, resulting in a net force of +1Gz towards the outside of the wheel. Things get a little weirder in the 3:00 and 9:00 positions around the wheel. At the 9:00 position, the outward force from the wheel rotation still pulls the rider into his seat with a force of +2Gz, but gravity also pulls him backward and into the backrest at +1Gx. At the 3:00 position is probably the least comfortable place on the ride, where the rider experiences +2Gz but also -1Gx. 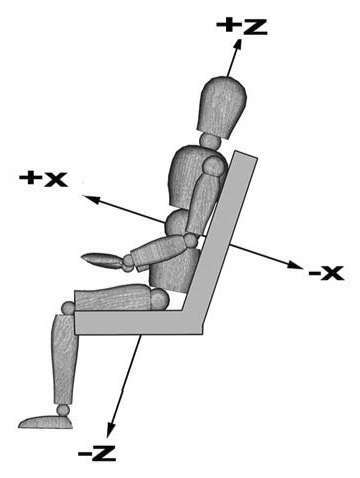 The resolved force is still pointing into the seat, but if you are wearing low-friction trousers this is where you might feel yourself sliding forward on the Fiberglas seat. Fortunately it won't last long. At top speed you are only facing downward for about a second at a time. Once the wheel has been lifted into its nearly vertical position, it presents a new problem. Fully loaded, the Witches’ Wheel passenger load alone may be in excess of 13,000 pounds, concentrated and distributed around the perimeter of the wheel. Once lifted into a vertical position, the wheel will tend to ‘want’ to remain vertical, in the manner of a gyroscope. Because it is vertical, gravity won't even tend to want to bring it down. The rotation is critical, as that is how the force holding riders in place is generated. The hydraulic lifting cylinder, in order to keep the total length of the cylinder short enough to fit under the ride, is a three-stage single-ended cylinder. Most hydraulic cylinders used in the amusement industry are single stage double-ended cylinders, where a rod is attached to a piston inside the cylinder, and fluid is fed into either end of the cylinder to push the rod in either direction. 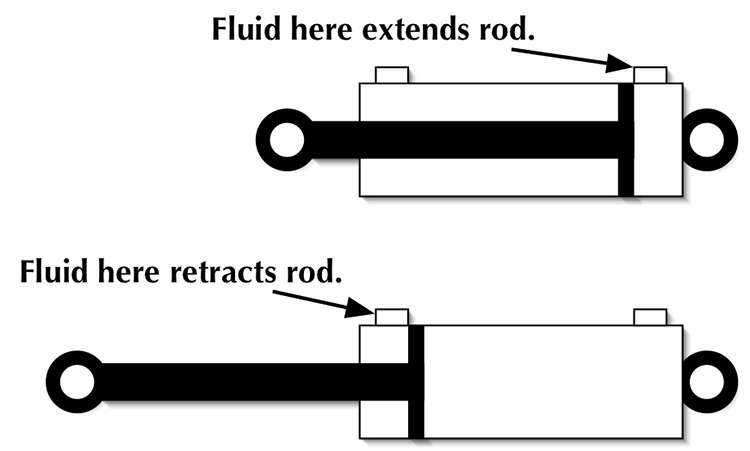 In a single-ended cylinder, fluid is pumped into one end of the cylinder to extend the rod, but there is no mechanism to hydraulically retract the cylinder. Simply opening the valve to let the fluid out won't do the job; something has to push on the rod to retract it. To solve this problem, there is a smaller single-stage pulling cylinder mounted near the base of the lifting arm. As the wheel is raised, hydraulic fluid is expelled from the top of the pulling cylinder and forced into a piston accumulator, not entirely unlike the ones used to power Top Thrill Dragster, but of course on a smaller scale. This puts the fluid under pressure, so that with the ride in its highest near-vertical position, simply opening the valve on the lifting cylinder and allowing fluid to flow from the accumulator to the pulling cylinder will pull the arm down from its vertical position. Once the arm is pulled over center, gravity will pull the arm the rest of the way down. By regulating the flow of fluid out of the multi-stage cylinder, the rate at which the arm comes down can be limited. The result is a nice, smooth ride down to a horizontal position. Once the arm has landed, the wheel rotation can be stopped. The pulling cylinder is seen here at the base of the lifting arm. That's all fine and good so long as things go well. What happens when things go wrong? Witches’ Wheel is equipped with a safety system that can automatically handle the most serious problems which may occur. In the event of a power failure, for example, the hydraulic pumps will obviously cease functioning. By opening a series of solenoid valves (by simply turning off the power to the valve operators), the main drive can continue to coast from its own inertia for a bit as the arm automatically lowers. Because the pulling cylinder uses a nitrogen accumulator instead of relying on pump pressure to pull the ride down, in the event of a loss of power, the ride can still be lowered even if it is in its highest position. If the ride is almost all the way up, it may not be possible to get the ride all the way down before the wheel stops rotating, or at least before the wheel stops rotating fast enough to keep the riders pinned to their seats. Because the wheel will bring itself down, even this should not be a serious problem. The gondolas are mounted in such a way that they can rotate through a full 360°. So in the event of a loss of centripetal force, the gondolas can freely rotate into a head-up position in every possible position except when the arm is in its fully raised position and the gondola is in the 3:00 position on the wheel. In that situation, only the gondola in the 3:00 position (and to a lesser degree the gondolas immediately adjacent) will be stopped in a face-down position. While it might not be particularly comfortable, it is not an inherently dangerous position. And even at that, it's only an unpleasant position while the wheel is vertical or nearly vertical. Once the wheel starts to come down, the gondolas will rotate to an upright or nearly upright orientation. A more serious problem would be a catastrophic failure of the hydraulic system, specifically a break in a hose or pipe on the lifting system. If this should happen, the ride is equipped with a safety valve which slams shut to prevent a sudden loss of fluid from the main lifting cylinder. The ride is designed to manage this situation by not shutting down. Instead, the ride continues to rotate, and the safety valve prevents the fluid from draining rapidly from the lifting cylinder, which would cause the wheel to crash down suddenly. Instead, an alternative method of lowering the wheel is required, which the manual says takes about six minutes and involves a hand pump. Once the wheel is down, it can be safely stopped. This is one of those rare cases where hitting the emergency stop button (killing power to the ride) is not necessarily the best course of action in an emergency situation. The new Enterprise gondola design. Photo courtesy Huss Rides. Just a few days ago, Huss Park Attractions GmbH announced plans to revive the Enterprise ride with the Enterprise 2G, Enterprise 2G-Plus and Enterprise 2GH models. The new ride is based on the Enterprise chassis, mechanism, and motion, but can feature a new gondola design. The new design eliminates the cage enclosure and offers side-by-side seats. 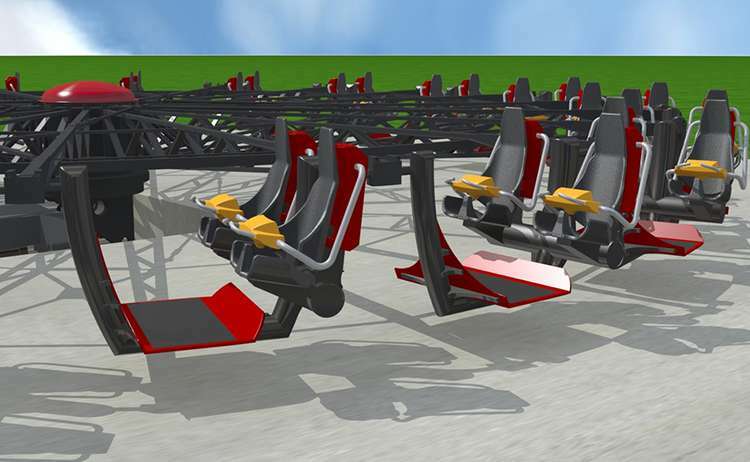 However, now that I have explained how the ride is a safe design without any active restraints, renderings of the new gondola indicate that the new seats will have lap bars. Some terms used in this article are used in the context of industry specific definitions found in ASTM F2291-14. 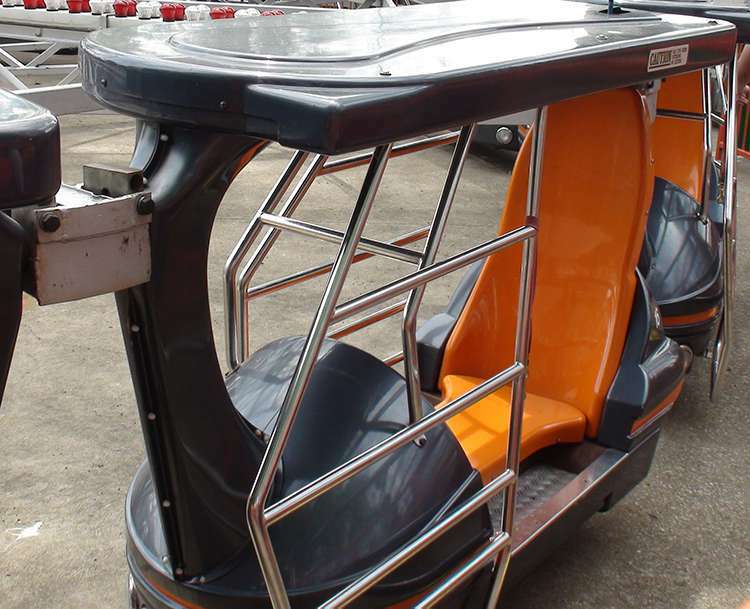 Features in an amusement ride or device that accommodate the patron for the purpose of riding the ride or device. This may include but is not limited to the seats, side walls, walls, or bulkheads ahead of the patron(s), restraint systems, and cages. System, device, or characteristic that is intended to inhibit or restrict the movement of the patron(s) while on the amusement ride or device. For more about hydraulic accumulators, consult the Top Thrill Dragster article on this site.